Jimmie Johnson is the only driver to win four consecutive NASCAR championships after placing 5th at the Ford 400 this weekend. 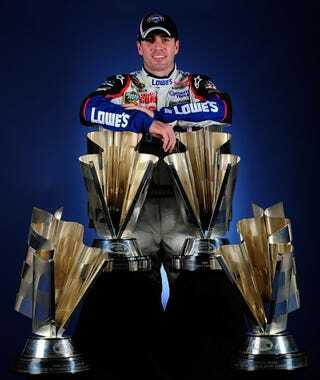 But does this really make him the greatest NASCAR driver ever? According to The Wall Street Journal, a study shows Darrell Walltrip, Dale Earnhardt and Cale Yarborough all had superior four-year runs in terms of finishes. For example, Yarborough finished in the top-five of 73.6% of his races between 1976 and 1979 compared to just 44.4% of races for Johnson. We're sure Jimmie would just say "Scoreboard" and go make-out with his four trophies.